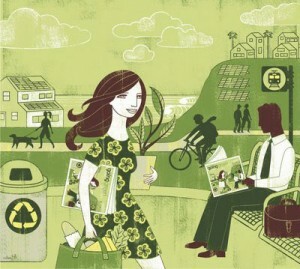 Thinking of making 2009 the year you go green? Every step, no matter how small, in the right direction helps. But now is a good time to make the most of the higher focus and energy the New Year brings in creating change. It's like there's something extra in the air at the beginning of the year - we seem to be more determined, more inspired, and more attentive to the things we want to change in our lives. Often, this transpires naturally into motives of how we can improve the lives of others and well... in true idealist fashion... the world. The health of our individual selves; the health of the planet - never before have these two aspects been more closely intertwined. So it's no wonder ‘going green' is the coolest thing since sliced bread. It has purpose. Its taking us back to our ancestral roots (relearning how to live using the sustainable ways of old), cleaning us out (starting the process of removing chemicals and pollution from our lives) and evolving our species to become a more united, conscious force. The result of going green is a general feeling of wholeness - feeling more alive and connected to community, and the acceptance that we must co-exist with nature's ways rather than against them. Have you ever heard an argument against Ghandi's appeal ‘we must be the change we want to see in the world'? I haven't. One individual being kinder to the environment seems like as good an example as any to begin the New Year with a banging eco change!